In the second period of a 2-2 tie game against the Flyers, Arizona Coyotes forward Vinnie Hinostroza got a two-minute minor for tripping and took a trip to the penalty box. It became the best thing that’s happened to his team all night. While the Flyers tried to enjoy their man advantage, the Coyotes instead enjoyed taking a two-goal lead over their opponents with a pair of short-handed scores coming in just 24 seconds. The whole sequence was top-to-bottom terrible for the Flyers, starting off when Derek Stepan picked the pocket of a clumsy Shayne Gostisbehere and—with the linesman running some interference—took it in for a go-ahead goal. Less than half a minute later, Oliver Ekman-Larsson sent a long clearance from deep in his own zone, which a speedy Michael Grabner picked up before Jakub Voracek so he could put-away the follow-up goal top shelf. Philly netminder Cal Pickard got benched in response. 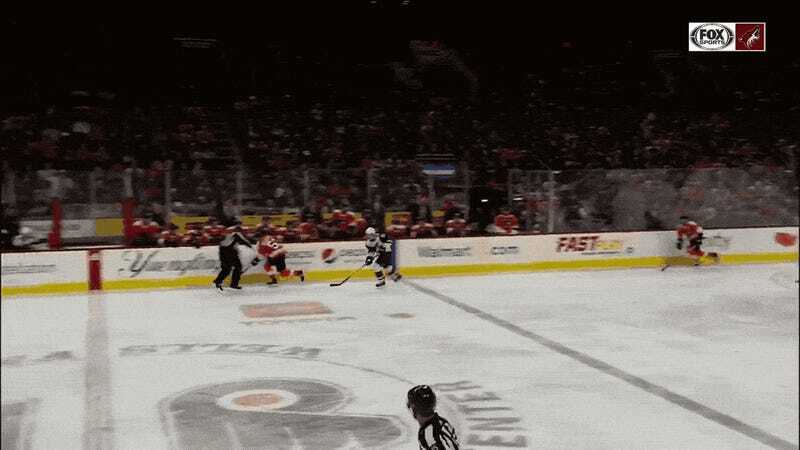 Arizona should give the Flyers a 5-on-3, just to see what would happen.